In his home outside Geneva, Switzerland, Phil Collins has pictures of himself with Nelson Mandela, the Prince of Wales and Robert Plant. But the one he values most is the painting of himself standing next to the ill-fated defenders of the Alamo. Painted by Gary Zaboly, a noted historian and author who is co-writing a book about the Alamo with the seven-time Grammy award-winner, its called “Travis’s Line” and it hangs in Collins’ basement/museum. In it, an imagined depiction of the Alamo’s American garrison in 1836, immediately before the famous battle, Collins is wearing a military uniform alongside 184 19th-century American frontiersman. Collins, who says he has been obsessed by Davy Crocket and the Alamo since he was a young boy, has one of the world’s largest collections of Alamo memorabilia including hundreds of cannonballs, a pouch once owned by Davy Crocket, a certificate proclaiming him an honorary member of the Sons of the Republic of Texas and a receipt signed by Alamo commander William Barrett Travis for 32 head of cattle to be used to feed the Alamo defenders. 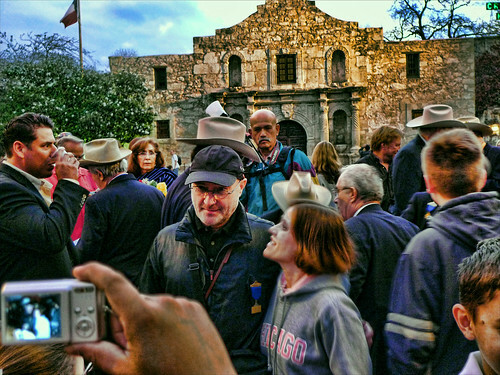 Collins has served on Alamo history panels alongside professors and other notable experts and regularly shows up in San Antonio to hobnob with Alamo groupies, one of whom told him he was one of the defenders in a previous life. Carolyn Raine, a documentary producer, lecturer and Native American cookbook writer, took it upon herself to let Collins know that he was the reincarnated Alamo messenger, John W. Smith, the red-headed horse courier whose nickname was El Colorado and who later became San Antonio’s mayor. This year, during the 175th anniversary of the battle made famous by John Wayne and, yes, Pee-Wee Herman, Collins agreed to play a free concert, but city red tape prevented it from happening in time for the March 6 commemoration, a yearly reenactment honoring the Texas heroes. With or without Phil Collins, it’s a great year to visit San Antonio and the 18th-century mission church where Davy Crockett, Jim Bowie and 188 others waged their famous last stand against the Santa Anna’s Mexican army. The most famous historical site in Texas, the mission has been restored to its original glory and offers tours, relics of the past and a gift shop with such memorabilia as John Wayne beach towels, chocolate Alamos and serious history books. And while you’re there, don’t miss the San Antonio River Walk with its cypress-lined paths that wind past boutiques, galleries, outdoor restaurants and now, with the addition of the Museum Reach, a new 1.3 mile stretch of river walk, several of San Antonio’s best museums including the San Antonio Museum of Art, housed in the old Lone Star brewery. Unusual art installations, native plants and waterfalls line the Museum Reach which culminates at the former Pearl Brewery that has been turned into a culinary wonderland with a weekly Farmer’s Market, unique restaurants and the opening of the third branch of the Culinary Institute of America. Colonial Spanish days comes alive at San Antonio’s five 18th-century missions and, after snapping a photo of yourself in front of the Rose window, you can wander La Villita, San Antonio’s first neighborhood that has been converted into boutiques, jewelry shops and restaurants. For more on this city that has captured Phil Collins’ heart, click here. Or contact the San Antonio Convention and Visitors Bureau at 800.447.3372. And if you don’t see Phil in person, you can hear his narration on a 13-minute “Alamo Diorama Light and Sound Show” at the History Shop near the former mission at 713 E. Houston St. Remember the ALAMO. Got a coonskin cap, had a coondog named Magnet and thinking back to 1976 when attorney Lee Chagra was murdered in his office “THE ALAMO” near. Now, the powers-to-be are persecuting Chagra’s nephew, a prominent Businessman, Billy Abraham in El Paso for running over a vagrant jay-walker on a dark street after leaving his bar. GO FIGURE. The Border Patrol was out of “assigned duty” position and are probably some FIBbers tool.